Infectious and zoonotic disease outbreaks have been linked to increasing volumes of legal and illegal trade. Spatio-temporal and trade network analyses have been used to evaluate the risks associated with these challenges elsewhere, but few details are available for the pig sector in South Africa. Regarding pig diseases, Limpopo province is important as the greater part of the province falls within the African swine fever control area. Emerging small-scale pig farmers in Limpopo perceived pig production as an important means of improving their livelihood and an alternative investment. They engage in trading and marketing their products with a potential risk to animal health, because the preferred markets often facilitate potential longdistance spread and disease dispersal over broad geographic areas. In this study, we explored the interconnectedness of smallholder pig farmers in Limpopo, determined the weaknesses and critical control points, and projected interventions that policy makers can implement to reduce the risks to pig health. The geo-coordinates of surveyed farms were used to draw maps, links and networks. Predictive risks to pigs were determined through the analyses of trade networks, and the relationship to previous outbreaks of African swine fever was postulated. Auction points were identified as high-risk areas for the spread of animal diseases. Veterinary authorities should prioritise focused surveillance and diagnostic efforts in Limpopo. Early disease detection and prompt eradication should be targeted and messages promoting enhanced biosecurity to smallholder farmers are advocated. The system may also benefit from the restructuring of marketing and auction networks. Since geographic factors and networks can rapidly facilitate pig disease dispersal over large areas, a multi-disciplinary approach to understanding the complexities that exist around the animal disease epidemiology becomes mandatory. Infectious and zoonotic diseases outbreaks have intensified in past decades through more intense interconnectedness, rapid transport, the opening-up of borders and increasing volumes of legal and illegal trades (Jones et al. 2013; Perry, Grace & Sones 2013). Spatio-temporal analyses have been used in veterinary medicine and other fields in recent times (Jiang, Ediger & Bader 2009; Paul & Dasgupta 2012; Rivas et al. 2012). Specifically, geographic factors such as roads, water bodies, distances from other outbreaks and markets, among other factors, have been found to play important roles in disease transmission (Food and Agriculture Organization of the United Nations [FAO] 2013; Jori et al. 2009; Korennoy et al. 2014; Pastrana et al. 2014; Rivas et al. 2010, 2012; Sánchez-Vizcaíno, Mur & Mártinez-López 2012). In addition, trade practices have played major roles in the spread of infectious diseases among livestock (Fournié et al. 2013; McCarron et al. 2015). Limpopo province is very important in the epidemiology of some transboundary animal diseases in South Africa. In particular, the province has been designated as a control zone for African swine fever together with certain areas of the North West and Mpumalanga provinces (Department of Agriculture, Fisheries and Forestry [DAFF] n.d.; Penrith 2013). Furthermore, the province provides an active domestic animal-wildlife-human interface, making it an ideal location for One Health studies involving zoonoses or disease interactions between wildlife and domestic animals. Pig production systems and the particular contributions of the emerging small-scale pig farms (ESSPF) in the Limpopo have been described recently (Mokoele et al. 2014). However, the presence of a deeprooted dual market structure remains a major challenge facing small-scale pig producers in the province (Antwi & Seahlodi 2011). While the commercial pig farmers use the formal markets (standard abattoirs, processing plants and supermarkets), the ESSPF farmers can access only the informal markets (local auctions, backyard slaughter, pension sale points and local abattoirs/slaughter slabs). The most popular auction point and abattoir used by the ESSPFs from Limpopo are Belfast (Mpumalanga) and Bronkhorstspruit (Gauteng) respectively. These locations, which are outside the province, present the ESSPFs with better marketing opportunities and higher incomes for their products. While the commercial interests of the ESSPFs are being secured through these more affluent markets, breach of biosecurity remains evident and the risk of introducing infectious pathogens to non-endemic areas remains high, with imminent threats to the pig industry nationally. Martínez-López, Pérez and Sánchez-Vizcaíno (2009) and Lindstróm et al. (2009) have previously identified such risks elsewhere. ASF is a severe, highly transmissible viral infection of domestic pigs that manifests itself as a haemorrhagic fever, which can cause mortality of up to 100% in domestic pigs with consequent devastating effects on the livelihoods of farmers who depend on pig production (Bastos, Fasina & King 2014; de Glanville et al. 2014; Fasina et al. 2012a; Penrith 2013). To date, three types of epidemiological cycle have been described for ASF in southern Africa (Penrith, Thomson & Bastos 2004). The first documented outbreak of ASF in South Africa was recorded in 1928 and this was related to contact between wild pigs and domestic pigs (Penrith 2013; Penrith & Vosloo 2009). Between 1933 and 1939, historical outbreaks of swine fever were documented (De Kock, Robinson & Keppel 1940); cases may have been classical or African swine fever, as no clear distinction was established between the two diseases in earlier years (Penrith 2013). Since 1939, South Africa has experienced only sporadic outbreaks that have been limited to the ASF-controlled zones of Limpopo and the Kruger National Park (Boshoff et al. 2007). Although parts of the North West province are designated within the control zones, ASF had not been reported there (DAFF 2014, Table 1). Recent events have, however, proved that the virus, although contained, has the capacity to spread rapidly from the controlled areas to new locations within South Africa (Table 1). In South Africa between 1993 and 2012, 1309 cases of ASF were documented between 1993 and 2012 from 71 outbreaks in South Africa (Table 1; DAFF 2014). Limpopo has accounted for 76.1% of all outbreaks to date and the majority of outbreaks from other provinces have links with Limpopo (Table 1). In September-October 2011, Mpumalanga and Gauteng experienced the first outbreak of ASF to occur outside the control area in recent times. Briefly, some pigs died in a small piggery within the ASF control area in Lephalale (Ellisras), Limpopo with the subsequent sale of surviving pigs at an auction in Sundra, Mpumalanga, and their transportation to Rietpoort abattoir in Gauteng. By January 2012, a total of 172 farms including some 10 374 pigs have had primary or secondary contacts with the index farm and only the prompt and co-ordinated intervention of the meat inspectors, private and government veterinarians, the industry and the laboratory (Transboundary Animal Diseases Programme (TADP)) curtailed the outbreaks and eradicated the infections (Evans 2012; Spencer 2012; Spencer & Penrith 2014). In this study, we used the spatio-temporal data of locations, possible interactions and marketing structures practised by the emerging small-scale farming communities in Limpopo to draw a network of ESSPF, conduct some spatio-temporal analyses and integrate the outcomes with historical and recent reports of ASF outbreaks in South Africa to map the probable risk, spread and consequences of ASF. In addition, because Limpopo has played a significant role in the outbreaks and dissemination of ASF in South Africa and the province has been declared an ASF-endemic location, we used ASF as a model for a rapidly spreading transboundary animal disease amongst pig populations. As part of the questionnaire survey conducted for a study on the production systems and dynamics of the ESSPF in Limpopo (Mokoele et al. 2014), the geo-coordinates of all the surveyed ESSPF were obtained using the Garmin Nuvi® or the Nokia Lumia 635® and entered into a Microsoft Excel® spreadsheet. Briefly, Limpopo consists of five districts, namely Sekhukhune, Capricorn, Waterberg, Vhembe and Mopani. A purposive sampling method was targeted at all the available ESSPF farmers (n = 185) in these districts. An original list of 85 small-scale pig farmers was produced by the Limpopo Department of Agriculture but an additional 100 farms that fall within this category but were not listed were recruited into the survey because the preliminary evidence from the field suggested that there were many unlisted ESSPF in the province. The inclusion criterion for the present study was pig farms with < 50 sows, located within the five districts of Limpopo that have been active in pig production for at least one year (Mokoele et al. 2014). A participatory research model approach was used to collect information from the farmers (Raman, Sanghi & Chambers 1989). Of the 185 ESSPFs sent questionnaires, a total of 164 (88.65%) participated fully and filled in the questionnaires completely. All the data were entered into Microsoft Excel® and checked for consistency, correctness and validity. A preliminary map was drawn to check that all the places surveyed fell within the correct locations within Limpopo, based on the data obtained. Data were formatted to meet the need for cartography software in ESRI's ArcGIS/ArcView, the R and the NodeXL software and exported appropriately. Extracts of the reports on the ASF outbreaks to date in South Africa were integrated into the final social network maps in order to predict the risk of ASF and advise on intervention strategies. ESRI's ArcGIS 10.1 software was used to add into the GIS all the specified geographic co-ordinates of the ESSPF farmers as XY co-ordinate data. 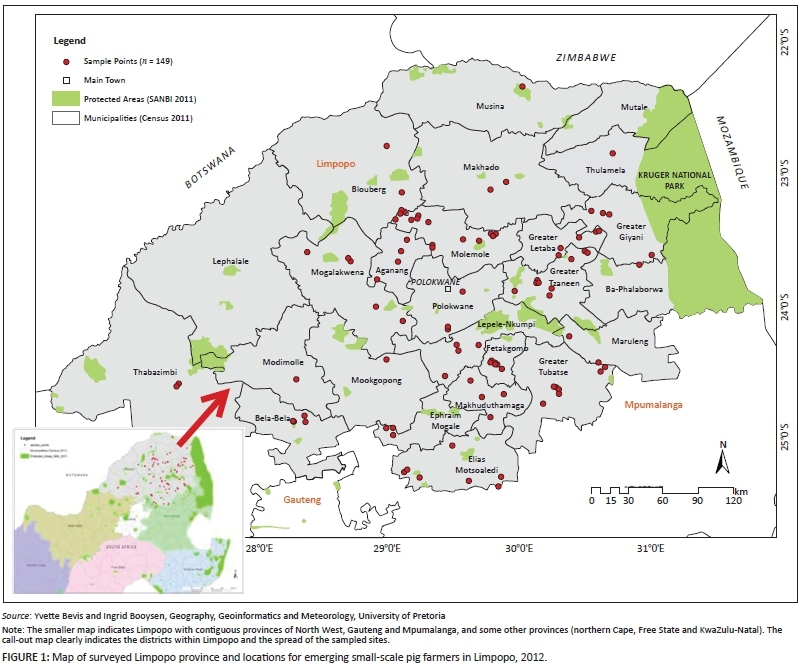 The resulting event layer was then displayed as a point symbol (red dot) portraying the locations of the small-scale pig farmers on an administrative map of Limpopo (Figure 1, Census 2011). Additional fields were added to the initial attribute table of the feature to enable the selection of farms by their designated abattoir. Thereafter the 'XY to Line' feature tool was used to construct geodetic lines or linkages (Figures 2a and 2b) representing the shortest distance between the farm and the destination point (the abattoir or auction point). Pig farmers who used local slaughtering points within their localities were represented by symbols (red dots) on these two maps. In addition, layers of the primary and secondary road networks within Limpopo and contiguous provinces were made on the map previously generated (Figure 3). Unidirectional networks: Firstly, filtered data were imported from the open Microsoft Excel® workbook into the NodeXL environment and manipulated appropriately for analyses based on the software manufacturer's instructions (NodeXL version 1.0.1.326, Connected Action). Unidirectional graphs with 28 vertices were produced. The graph's vertices were grouped by cluster using the Clauset-Newman-Moore cluster algorithm and laid out using the Harel-Koren Fast Multiscale layout algorithm. The edge colours, widths and opacity were based on edge weight values. The vertex sizes were based on betweenness centrality (BC) values. For emphasis, a graph or network is a set of vertices and edges connected together [G = (V, E)], edge [E] is an association linking two vertices, and vertices [V] are points or locations joined by edges (Jiang et al. 2009). Multidirectional graphs: In the second instance, data were exported into the R software environment and mapped for in-going (in-degrees) and out-going (out-degrees) contacts using the modified method of Noremark and Widgren (2015). Multidirectional graphs were produced separately for in-degree and out-degree links. In addition, the k-cores (strength of contribution of each vertex in the total network) were produced based on the number of links that influence each vertex. A total of 164 ESSPF were categorised based on the number of sow units (SU) as follows: 1-10 SU (n= 124; median = 4, CI95% = 4-5); 11-20 SU (n = 17; median = 15, CI95% = 13-16); 21-30 SU (n= 7; median = 26, CI95% = 23-29); 31-40 SU (n = 2; median = 38, CI95% = 6-69); 41-50 SU (n = 1; median = not applicable, CI95% = not applicable). An abattoir was the preferred slaughter point for the majority of respondents (105/164; 64%) and the abattoir of choice for the ESSPF from Limpopo was Bronkhorstspruit in Gauteng (55.9%) and Phalaborwa (26.2%) and Thabazimbi (10.4%), both located in Limpopo. A total of 97.6% of the surveyed ESSPF preferably chose the Belfast auction in Mpumalanga to source their pigs or sell whole animals (Figures 2a and 2b). Importantly, some ESSPFs (34.1%), especially those from Capricorn district prefer to slaughter pigs within the communities or at pension points (Figures 2a and 2b). Up to 306 pigs were marketed monthly (mean/month = 283) by the surveyed farmers and a total of 3396 pigs were sold in the year 2011 preceding the survey. The ESSPFs were randomly dispersed throughout Limpopo, with a tendency for greater farm concentrations around Capricorn, Mopani and Greater Sekhukhune districts (Figure 1). However, no specific pattern exists for the farm distributions or choice of slaughter or sale facility and for the distances from the closest national or secondary road(s) to the farms (Table 2; Figure 3). The average distances between each of the slaughter or sale locations and the nearest national or secondary road networks are shown in Table 2. In addition, the distance covered to travel with the animals to the Belfast auction may be as short as 50 km up to a distance of about 400 km. The distances travelled to get to local abattoirs or slaughter points were within 5 km for local slaughter points, 150 km for Phalaborwa abattoir, 200 km for Thabazimbi abattoir and up to 400 km for Bronkhorstspruit abattoir (Figures 2a and 2b; Mokoele et al. 2014). The preferred means of transportation includes own vehicle (34.5%), hired vehicle (5.4%), shared vehicle (1.4%) and other means (58.8%, n = 148). Using the in-going (in-degree) and out-going (out-degree) movement to and from the vertices, the most important nodes for disease spread are locations (Phalaborwa, Tzaneen, Belfast auction, Bronkhorstspruit abattoir, Elias Motsoaledi, Molemole), pension points or local markets, Tubatse, local slaughter points and Polokwane in that order (Figures 2a and 2b, 4-7). Phalaborwa also has the highest degree of centrality whereas the top ten vertices ranked by BC were the local slaughter points, Phalaborwa, Thabazimbi, Bronkhorstspruit, Molemole, Ephraim Mogale, Letaba, Tzaneen, Makhado and Blouberg (see Figure 5 and Online Appendix 2). Overall, the unidirectional graph has 28 vertices and 2 unique edges with a total of 161 edges. There were 4 connected components with an average geodesic distance (shortest path between points) of 1.48. The graph density (a function of the edges and vertices that make up a network) had a value of 0.06 and an average clustering coefficient (a measure of the degree to which nodes cluster together within the network) of 0.000 (Online Appendix 2). 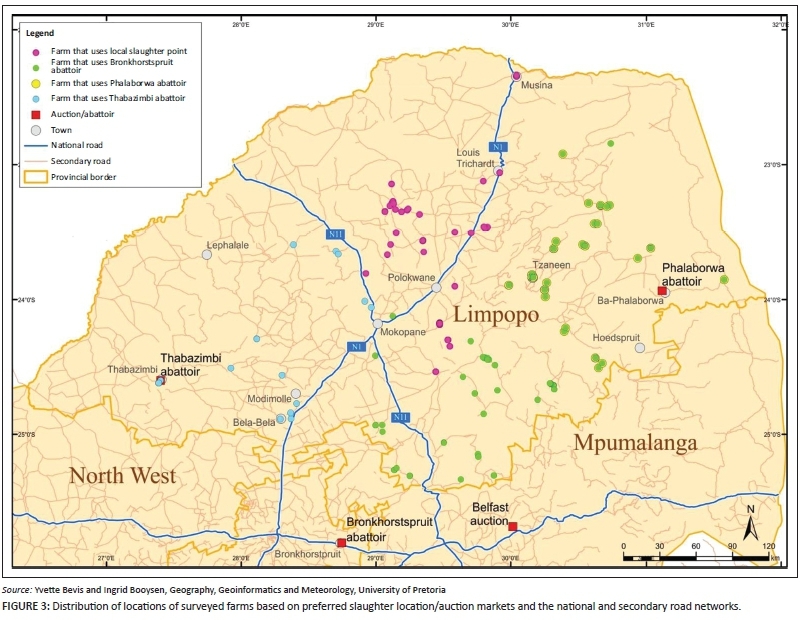 This study revealed that informal pig movements and trade networks in Limpopo exist. While we did not investigate the specific role of each farmer and the middlemen, we confirmed that trade-associated short and long-distance movements of pigs and pig products exist within the province (5 km -400 km). Monthly, up to 306 pigs may be transported individually or collectively in shared facilities over a short or long distance to major abattoirs or auction points and these transports may facilitate long-distance risk of disease dispersal. In a case of a rapidly spreading disease outbreak, trade by these farmers could facilitate the rapid spread of disease across broad geographic areas as was the case of the Lephalale-Sundra-Rietpoort (Limpopo-Mpumalanga-Gauteng) African swine fever outbreak of 2011-2012. It will be necessary to target the ESSPFs and associated downstream sector traders in this sector for animal health and biosecurity training. In addition, animal health intervention and prevention strategies should target these ESSPF (McCarron et al. 2015). Previous reports have confirmed that the majority of the past outbreaks of ASF have involved ESSPF from Limpopo (DAFF 2014). Several important nodes (towns and cities) with high levels of interactions and the potential to contribute to or rapidly spread pig pathogens inadvertently were identified. These nodes acted as dispersal and sometimes collection points. Phalaborwa, Thabazimbi, Bronkhorstspruit and Belfast are among such important points and there is a need to create surveillance points and inspection nodes around these locations. The first two locations are within Limpopo but the last two are located in the adjacent Gauteng and Mpumalanga, where higher market values are the main drivers for the ESSPFs travelling these distances. It will be important to improve pig marketing locally and add value to pork products in Limpopo to discourage long-distance travel, because such trips can pose a risk of spread of infection outside the control area. Although a movement control policy is implemented in South Africa, which includes a prohibition of the movement of pigs out of the ASF control area without a veterinary permit only issued under specified conditions, emergency situations and economic imperatives often challenge such policies. There is therefore a need for enhanced vigilance on the part of the authorities, including active surveillance and participatory epidemiology among the ESSPFs. In addition, there is a need to motivate ESSPF to apply good farming practice with improved biosecurity, which will be rewarded by access to a scaled-up pricing system for pork certified by local veterinarians through a government support system (Fasina et al. 2010, 2012b; Logar 2014). Since local slaughter and pension point sales were also revealed as important trade nodes, these activities may conceal the existence of subclinical infections and prevent early detection of rapidly spreading transboundary animal diseases. Limpopo is of major interest because the great majority of ASF outbreaks over decades have occurred or originated there. It is an important disease node not only for ASF but potentially for other pig diseases. While the movement of pigs between farms was not evaluated in this study, we are aware that such movements exist (Mokoele et al. 2014). 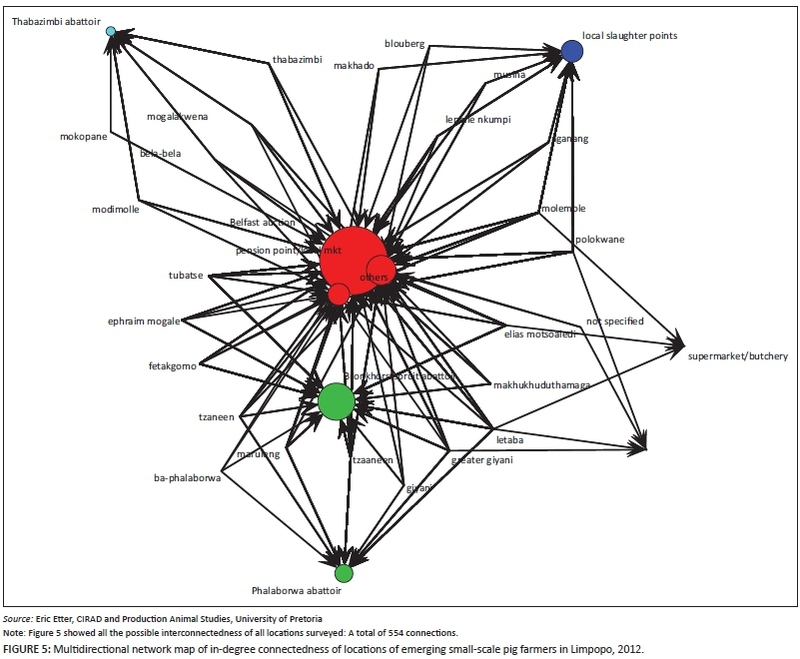 Social networks associated with pig farms are important factors in the transmission of infectious diseases (Leslie et al. 2015). Our model has identified local slaughter points and other abattoirs as potentially having the greatest influence on disease dispersal. Strict anticipatory planning should be implemented in these locations and controlled slaughter should be encouraged (Kao et al. 2007; Lindstróm et al. 2010). An assumption that all disease algorithms often exhibit 'small world' properties in a situation of close interconnectedness in temporal and spatial locality (Jiang et al. 2009); in the real world this may not always be true. An assumption that an analysis kernel of BC can resolve all complexities of interconnectedness by measuring the shortest distances passing through vertices (Freeman 1977). The networks can sometimes identify false positive edges and false negatives especially where background noises are high in the dataset (Ufimtsev & Bhowmick 2013). False positives may arise when two vertices have low to medium BC scores, which can combine to produce one with a high BC score. We have reduced this by creating four different networks for each identified node. Finally, the threshold in a given group testing may be affected by the false positive BC values. We have corrected for this influence in the course of the modelling. In conclusion, we have produced evidence that geographic factors and trade-movement networks played roles in ASF dynamics and dispersal in South Africa and that managing these in Limpopo province is critical for pig disease control. We acknowledge the Limpopo Department of Agriculture as the provider of funds for this survey as part of a postgraduate programme through the Human Resource Development Section, the Director of Veterinary Services in Limpopo province, Dr Mampane, and his team of managers in the districts and all the veterinary officials for their help with the collection of data in their respective districts. The Department of Production Animal Studies and the Faculty of Veterinary Science, Onderstepoort partially supported this work with funding and resources. We thank Marc A. Smith and the team at Connected Action Consulting Group (http://www.connectedaction.net/) for assistance with SNA mapping. We gratefully acknowledge the input of Assoc. Prof. Eric Etter (University of Pretoria) for assistance with multidirectional SNA. F.O.F. (University of Pretoria) and J.M.M. (University of Pretoria) designed the study. J.M.M. carried out the field survey. F.O.F. carried out the statistical analyses. B.T.S (University of Pretoria) and L.A.M.L.v.L. (University of Pretoria) supervised the project. Y.B. (University of Pretoria) and I.B. (University of Pretoria) drew the maps and contributed materials for the study. All the authors contributed to the writing and revision of the manuscript and its final approval. F.O.F. was the project coordinator.